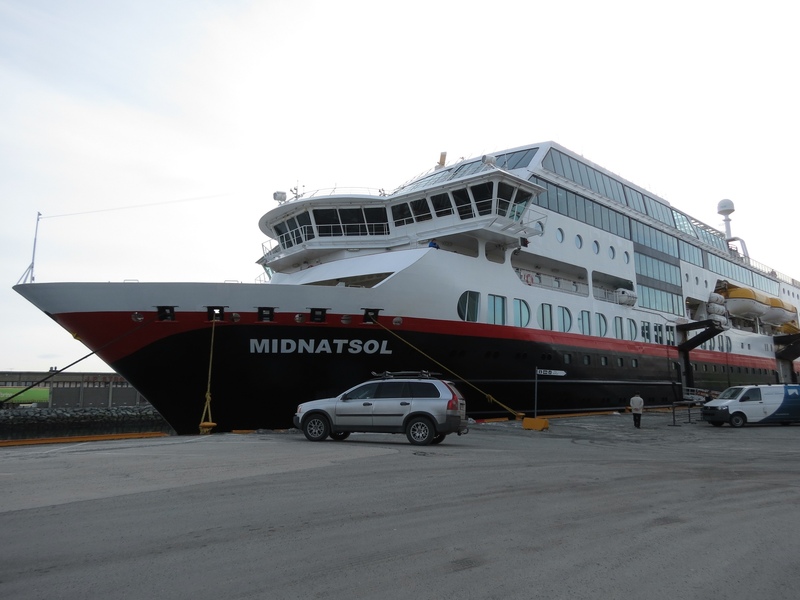 True to its roots, Hurtigruten continues to run its ferries to service the western ports of Norway. Unlike cruise ships which typically sail all night and arrive the next morning for a day in port, Hurtigruten's ships make continuous stops all along the way – day and night. Most are short in duration, long enough to exchange cargo and deliver the mail, and the ships are very adept at docking and departing quickly. 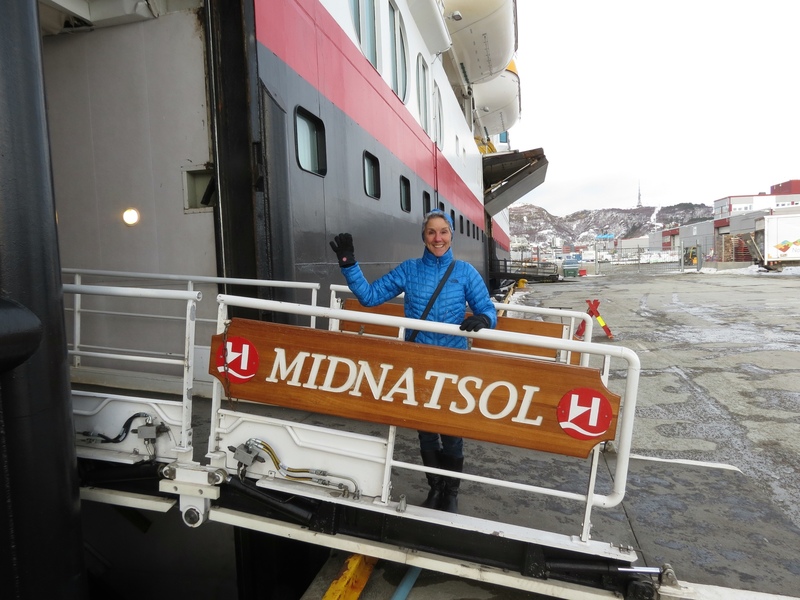 Our trip up the coast of Norway from Bergen to Tromso on the MS Midnatsol takes five days and four nights. During that time we make about 4-5 stops a day, and once a day our stay is long enough for a trip on shore. Timing is erratic – it might be first thing in the morning, it may be mid-afternoon, with sightseeing time ranging from 2.5 hours to 6. The towns are all easily accessible from the dock by foot, and are small enough to explore in a few hours. Being both frugal and eager for some exercise off ship, we pass on the formal shore excursions. Choosing instead to walk the cities guided only by the limited information I can glean from my guidebook, we meander in search of known sights and hope to stumble on some unexpected delights. And we manage to find both. 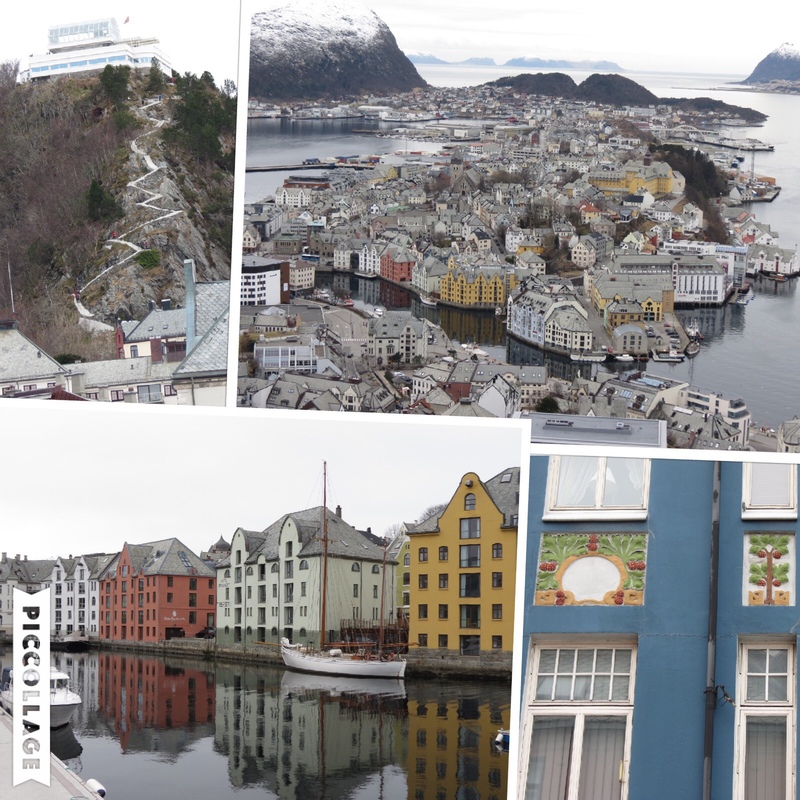 Alesund is our first stop, a town destroyed by fire in 1904 and rebuilt in the Art Nouveau style. Its center is adorned by ornate buildings in vibrant colors, with intricate designs painted on their facades. I am immediately attracted to the viewpoint high above the city, eagerly climbing the 419 zigzagging steps required to reach it. Despite cloudy skies, the views are expansive and rewarding. Exploring the quiet streets afterwards I am able to see the detail up close and observe the local flavor. Nursing a bum leg and discovering some intriguing birds, Rich is content to pursue his own interests. An obligatory visit to the cathedral in Trondheim might have been unremarkable had it not been for the information imparted by the robed man who greeted us inside the door. With an air of conspiracy, he shares that organists will be practicing from 10 until noon and invites us to return to hear the newly refurbished organ. Whiling away the time before the music, we discover a delightful sight – a group of school children cross-country skiing alongside the river that runs through town. They could not be more than 7 years old, yet they fly across the snow with youthful glee and uninhibited athletic prowess. And speaking English! We learn that these youngsters are attending an international school. Their one-piece snow suits stir old childhood memories. Once back inside the gothic cathedral, the huge silver organ pipes roared to life in fits and starts as the first organist runs through segments of his repertoire. Some of it is sonorous and dissonant, other bits more pleasing. Worth hearing, but a taste is sufficient. Our return trip to the ship takes us through the most pleasant section of the city, an area refurbished into trendy housing and reportedly colorful eating and drinking establishments. More colorful buildings line the waterway, and I especially enjoy their distorted reflections in the water. Not every town is particularly scenic. Bodo was almost entirely razed during World War II, hence is dominated by modern buildings of little interest. I always enjoy marinas, however, and while Rich is scouting some floating birds to photograph, I dally long enough to watch a local fisherman selling shrimp right from his boat. Very fresh! A cold wind whips through town, and with few other sights that intrigue us, we retreat to the Corner Cafe for hot chocolate, Diet-Coke and apple cake. Indeed a welcome respite. Our time on shore is a nice interlude. But the fjords and coastline await so we return to the ship, enriched by visiting these ports of call. 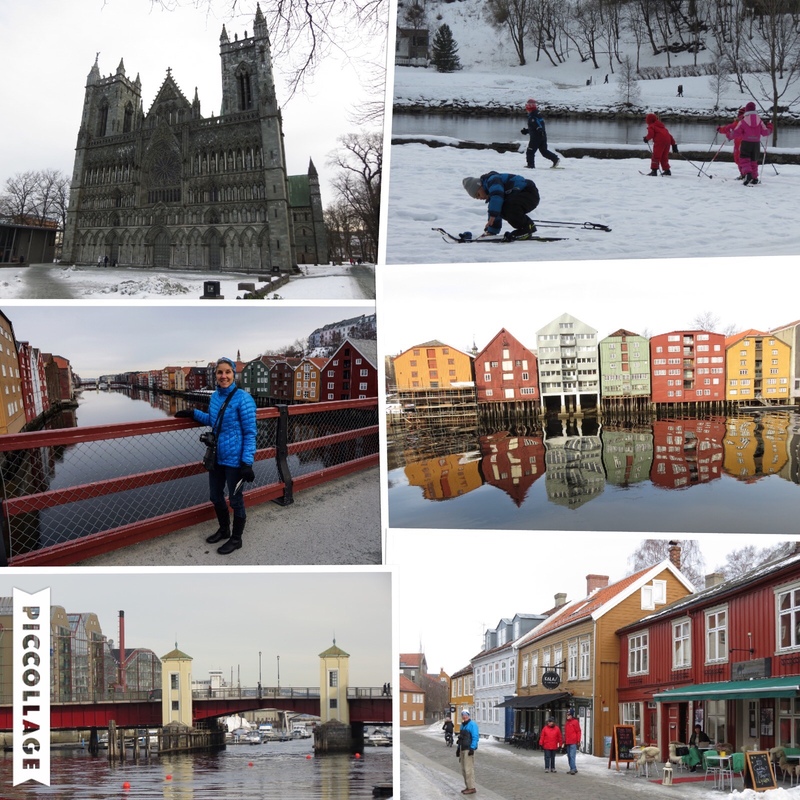 This entry was posted in Travel and tagged Norway, Travel by Molly. Bookmark the permalink. Thank you, thank you, thank you for sharing your trip. I’ve been hungry for details and especially pictures. Love the colors! Although we are strong birders…we are also fond of observing everything within the reach or our cameras. You guys are the Ying and Yang of the story….good thing you have and share your different views of the world. Loving both sides of the story! Keep on writing posts like this so we can enjoy sharing your trip. Love the pictures. Looks like if you are enjoying everything. Will be looking for more pictures! Love reading this Molly! Reminds me of past cruises in another part of the world. I love not going down touristy paths, rather let the locals guide us. It works every time.